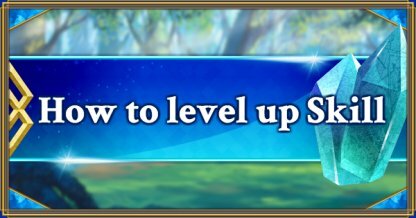 On this page you'll find our explanation of Skill leveling in the game FGO (Fate/Grand Order). We've also summarized how much QP you'll need, so please use this as your guide when you level up Skills in FGO. 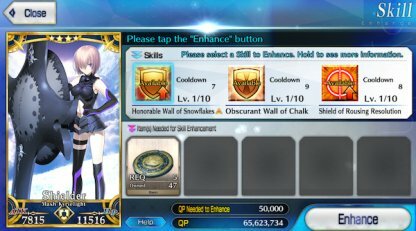 To level up a Servant Skill, first chose the "Enhance" option from the MENU bar, then select "Skill" in the Enhancement screen. You'll need to use Items and QP to level up your Servant Skills. Which Items you'll need depends on the Servant. The required number of Items or amount of QP increases for High Star Servants. 5★ Servants in particular need a large amount of Items and QP to level up their Skills. Regardless of a Servant's Class or their number of Stars, their maximum Skill level is Lv. 10. Once all their Skills have reached Lv. 10, they cannot be leveled up any further. At the start of the game the benefits of Ascension far outweigh those of Skill leveling. So it's better to use your Items to Ascend Servants rather than focusing on their Skills.Once you have 2-3 Servants of each Class up to about Lv. 60, then you should begin leveling up Skills. Essentially if you raise a Skill's level, its effect is multiplied. The rate of multiplication is distinctive to that Skill. In this case, there is a 2% rise for each level increase, and from Lv. 9 to Lv. 10 there is a 4% rise. If you compare Lv. 1 and Lv. 10, in total there is a difference of 20%. The benefits of Skill leveling in this example are comparatively high. In this case, there is a 1% rise in the Skill's effect for each level increase, and from Lv. 9 to Lv. 10 there is a 2% rise. If you compare Lv.1 and Lv.10 the difference is 10%.This rise is small in comparison to Example 1, so at low levels, the Skill's usefulness won't seem to change much. Skills have a CT rate - this tells you how many turns have to pass before a Skill can be reused - and can vary depending on that Skill. When a Skill reaches Lv. 6 their Cooldown rate is reduced by one turn, and again at Lv. 10. At the most, a Skill can be activated at short intervals of 2 turns. :pIn the case of a Skill with a CT of 7 at Lv. 1 - the CT is shortened to 6 at Lv. 6, and down to 5 at Lv. 10. 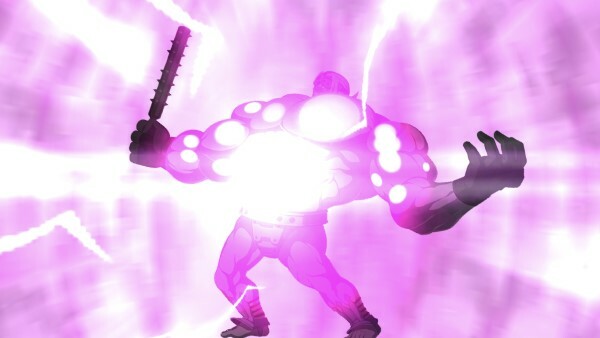 With a CT of 5 and a 3 turn effect, there only needs to be a space of two turns when the Skill is not activated.You can therefore almost continually have this Skill in effect during battle. By leveling up a Servant's Skills, the strengths of that Servant can be lifted to a new standard. Skills that charge the NP gauge are particularly beneficial when farming Quests, and by pairing these with the right Craft Essence, Noble Phantasms can be employed more rapidly. ▲For Servants with Skills that charge their own NP gauge, there's often a direct relation between Skill leveling and how that Skill is used. There are some high level Quests in FGO featuring powerful enemies with huge amounts of HP. To defeat them you'll need Servants with a suitable amount of firepower and durability. Skill leveling makes it easier to clear these Quests. You can acquire Skill Enhancement Items in Events and Free Quests. However drop rates in Free Quests are low, so they're not suited to gathering such Items. You're much better off trying your luck in Events. Events rarely award Gems, Magic Gems, or Secret Gems, so instead we recommend you try "Training Ground" Daily Quests. Though please take note, the targeted Class for these Quests changes depending on the day of the week. Raising a Skill level from Lv. 9 to Lv. 10 uses up 1 Crystallized Lore, regardless of the Servant or their rarity. Other than as rewards in certain Events, the opportunities for acquiring Crystallized Lore are limited, making them an extremely precious Item. Think hard before you use them on one of your Servants. When you don't have enough QP to carry out Skill Enhancements, there's only one real option - the "Treasure Vault" Quests. Try also to select a Support Servant equipped with the "Mona Lisa" Craft Essence which increases the amount of QP collected. 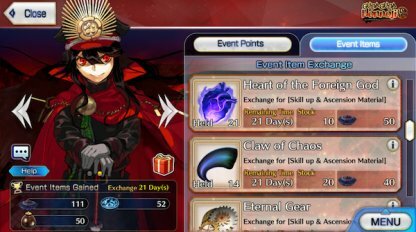 Exchange Items for QP in Events with high drop rates. Repeatedly farm Lottery Events to earn even more QP. Only in some special Events can you get your hands on this in-game currency.